*The share price is the closing price on October 31. The number of shares issued was obtained by subtracting the number of treasury shares from the number of outstanding shares as of the end of the latest quarter. This Bridge Report outlines the results of ITO EN for the first half of the fiscal year ending Apr. 2019 and the outlook for the term ending Apr. 2019. ITO EN mainly manufactures and sells beverages (including green tea, coffee, and vegetable juice), and tea leaves, and also operates restaurants and conducts franchise (FC) business of Tully's Coffee, etc., manufactures and sells supplements via its subsidiaries. In Japan, the company has the largest share of 33% (as of Dec. 2017) in the market of green tea beverages, including "Oi Ocha." In addition, it owns a variety of popular product brands, such as "Kenko Mineral Mugicha" (healthy mineral barley tea) which is the bestselling caffeine-free tea beverage, "Ichinichibun no Yasai" (One Day Veggie), the most selling 100% vegetable beverage, and "TULLY'S COFFEE" which is the top-selling bottle-shaped canned coffee product developed in cooperation with Tully's Coffee Japan Co., Ltd.. Each of them has achieved an annual sales quantity of over 10 million cases ("Oi Ocha" has sold more than 80 million cases). The ITO EN Group is composed of 31 consolidated subsidiaries, including Tully's Coffee Japan Co., Ltd. and Chichiyasu Company, and 3 companies accounted for using the equity method. With the aim of becoming a "Global Tea Company," it is developing the brand and cultivating new green tea markets in the U.S. (mainly New York), Australia, China, and Southeast Asia. 【Management Principle "Always Putting the Customer First"】 【Five Concepts for Product Development since the Establishment of the Company】 【Outline of the business】 The business of ITO EN is classified into the Tea Leaves and Beverages Business, which manufactures and sells tea leaves and beverages, the Restaurant Business, in which Tully's Coffee Japan Co., Ltd. operates specialty coffee shops and FC business, and The Others, in which Mason Distributors, Inc. (Florida, the U.S.) manufactures and sells supplements. For the term ended Apr. 2018, the sales of ITO EN (non-consolidated) accounted for 84.1% of the Tea Leaves and Beverages Business (77.4% of consolidated sales). As for the composition of the sales(non-consolidated), tea leaves make up 9.3%, beverages 89.7%, and others 1.0%. 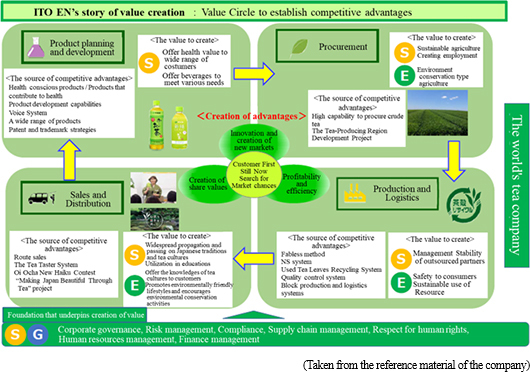 【ITO EN's story of creating value-Value cycle for establishing competitive advantages (cycling value chain and value creation)】 The business of ITO EN can be characterized by value creation through the cycling value chain "Planning and Development of Products ⇒ Procurement ⇒ Manufacturing and Logistics ⇒ Sales." In "Planning and Development of Products," the company creates value by offering health value to a broad range of customers and providing beverages for meeting a variety of needs (S). In "Procurement," the company conducts the Tea-Producing Regions Development Project for the purpose of procuring high-quality tea leaves stably, and this activity leads to sustainable agriculture (S), creating employment (S), and even environment conservation type agriculture (E). In "Manufacturing and Logistics," the company contributes to the stabilization of business administration of entrusted manufacturers (S), ensures the safety and peace of mind of consumers, and conducts sustainable resource utilization through Used Tea Leaves Recycling (E) to promote environmentally friendly management. 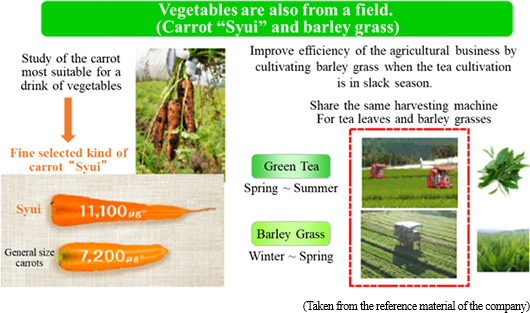 In "Sales," the company contributes to society by providing knowledge (tea culture) by holding seminars about how to brew tea (S) and transmitting the Japanese traditional culture through "ITO EN Oi Ocha New Haiku Contest" from generation to generation (S), promotes environmentally friendly lifestyles, and engages in environment conservation activities (E). The (non-consolidated) sales volume grew 5.2% year on year, mainly thanks to Japanese Tea and Healthy Tea beverages. In the first half, the extreme summer heat produced favorable effects for ITO EN, but a series of natural disasters, including the Osaka Earthquake in June, the torrential rain in western Japan in July, the Hokkaido Eastern Iburi Earthquake in September, and Typhoons No. 21 and No. 24, affected the production and supply chain of each beverage maker. In these circumstances, the company saw an affiliated factory in the Chugoku region being damaged, and the power outage and disturbance of JR freight transportation caused by the Hokkaido Eastern Iburi Earthquake, etc., but the company sold over 1 million cases of the new green tea product "Oi Ocha Shinryoku" in about 3 months after its release in May, showing a good start of the product, and the sales of "Kenko Mineral Mugicha (healthy mineral Barley Tea)," which is the bestselling caffeine-free tea beverage for preventing heatstroke in the summer and rehydrating those who are enjoying sports, increased considerably. Accordingly, the total sales volume of beverages increased in the first half at a higher rate than that of the beverage market. Sales grew 3.6% year on year, while operating income declined 8.9% year on year. Sales were 275,468 million yen, up 3.6% year on year. Out of them, (non-consolidated) sales of ITO EN increased 4.5% year on year to 217,725 million yen. Thanks to the extreme summer heat, the sales of beverages rose 4.7% year on year, and the sales of tea leaves, which normally receive negative effects from the extreme heat, still increased 2.8% year on year. As for beverages, the sales of Japanese Tea and Healthy Tea, which are core products, grew 7.4% year on year. The sales of "Oi Ocha" grew 2.4% year on year, and the sales of "Kenko Mineral Mugicha," for which demand is growing as a beverage for replenishing water and mineral easily without sugar, caffeine, and calories, increased 16.5% year on year. The company also saw the growth of sales of "TEAs' TEA NEW AUTHENTIC Hojicha Latte," the Japanese tea with milk produced by adding milk to Hojicha (Roasted Green Tea), which is characterized by its sweet roasty aroma. As for vegetable beverages, sales declined 1.0% year on year due to the sluggish sales of fruit juice-blended vegetable beverages, etc., but the sales of Aojiru juice increased 23.5% year on year, and the sales of the vinegar beverage "Kurozu de Kassei (Revitalization Through Black Vinegar)," which is produced from "black vinegar made from rice" and "black vinegar made from barley" produced in Japan and is categorized into food with nutrient function claims (vitamin B1 and vitamin B6), grew. The sales of Coffee rose 0.9% year on year. The sales of the top-selling bottle-shaped canned coffee "TULLY'S COFFEE" were nearly unchanged from the same period of the previous year, despite the boom of 500-ml plastic bottled coffee. ITO EN plans to enrich the lineup of highly profitable bottle-shaped canned coffee as well as the lineup of 500-ml plastic bottled coffee. Operating income was 13,212 million yen, down 8.9% year on year. Due to disasters, etc., SGA, mainly selling commission and freight cost, augmented more than expected, and the growth rate of gross profit was as low as 2.6%. Considering the sales activities of competitors, the company curbed wholesale prices of Barley Tea beverages in the term ending Apr. 2019 and the ratio of sales of Barley Tea beverages in two-liter bottles increased due to the extreme summer heat. Accordingly, the growth of sales volume did not lead to the increase in profit enough. While foreign exchange gain increased from 217 million yen to 485 million yen, ordinary income declined 5.4% year on year. Sales will exceed 500 billion yen! It is expected that sales and operating income will grow 2.6% and 4.3%, respectively, year on year. In the second half, the company will sell mainly "Oi Ocha," "Kenko Mineral Mugicha," and "TULLY'S COFFEE" while putting importance on profitability. Therefore, the company has revised the estimated sales for the second half slightly downwardly, but revised the estimated profit upwardly, while reconsidering wholesale prices. It is expected that operating income rate will increase through the improvement of sales activities and the curtailment of SGA, mainly selling commission, advertising cost, and freight cost. According to the reference material of the company (source: Euromonitor), the scale of the global tea market was 67.1 billion dollars in 2017, and it is anticipated that the market will expand to 87.4 billion dollars in 2022. In the tea market that is expected to grow considerably, the company is selling "Oi Ocha" in 36 nations with the aim of delivering Japanese quality worldwide. In the first half of this current fiscal year, as the company revised the standards for products produced for overseas markets, it disposed of part of the tea bags of green tea and stopped sale of them in the first quarter. Thus, sales in the U.S. Business grew only 0.1% year on year to 156,290 thousand dollars, causing operating income to shrink 22.7% year on year to 7,368 thousand dollars (in yen terms, while sales remained flat, profit declined 22.8% year on year). The company modified the standards for products designed for overseas markets in reaction to the revision to the quality standards, not due to quality problems that could lead to health hazards. These revisions just reflect the company's strenuous efforts to become a "Global Tea Company." The company has completed the modifications to the quality standards and resumed sale, and immediate sales are healthy. Sales in the Other Overseas subsidiaries stood at 3,217 million yen, up 16.5% year on year, with operating income rising by 59.9% year on year. Sales grew especially in China that makes up 12-13% of the entire sales in the overseas business. For the full year, in the U.S. Business, sales will be 307,696 thousand dollars (down 3.1% from the previous term; down 5.4% in yen terms), and operating income will stand at 16,506 thousand dollars (down 9.6% from the previous term; down 11.7% in yen terms), and in the Other Overseas subsidiaries, sales are to be 5,796 million yen (up 10.8% from the previous term) and operating income is estimated at 1,015 million yen (up 68.9% from the previous term). By product, it is projected that tea bags will grow 23% and 24% from the previous term in the United States and in Asia and Oceania, respectively; Beverages will also grow 17% and 15% in the United States and in Asia and Oceania, respectively, and Macha products are expected to expand considerably 171% in the United States and 81% in Asia and Oceania. In Australia, ITO EN AUSTRALIA PTY. LIMITED has embarked on production of tea bags and will start selling the product in Australia and other neighboring countries. Growing tea leaves (with a crop yield of 309 tons on a 57-hectare farming land) and operating crude tea production factories, currently, the company sells green tea beverages that use tea leaves cultivated only in Australia. This summer, the Kanto-Koshin region witnessed the earliest end of the rainy season on record, and the record-breaking extreme summer heat helped grow the demand for thirst-quenching beverages. However, ITO EN curbed wholesale prices while expecting the sales activities of competitors in the term ending Apr. 2019, and therefore, it was not able to receive the merit of demand growth in profit in the first half. In the second half, the company will return wholesale prices to normal levels, and thoroughly carry out revenue-focused sales activities mainly for "Oi Ocha," "Kenko Mineral Mugicha," and "TULLY'S COFFEE." As part of these activities, the company revised the standards for evaluating marketing activities. As for "Oi Ocha", the company is advancing to cultivate female customers, which new products effects were an issue for, mainly in the 20s and 30s ("TEAs' TEA NEW AUTHENTIC Hojicha Latte," a Japanese-style tea with milk produced by adding milk to Hojicha (Roasted Green Tea), is popular among young female customers, although it is not categorized into "Oi Ocha").Customers drink "Kenko Mineral Mugicha" for not only replenishing water in the summer, but also replenishing water during sports or in the autumn and the winter as a beverage for replenishing water and mineral easily without taking sugar, caffeine, and calories. Its sales grew in Oct. and Nov. this year as it was relatively warm, and the demand for the product is apparently taking root throughout the year. The top-selling bottle-shaped canned coffee "TULLY'S COFFEE" was stably in demand, while 500-ml plastic bottled coffee becomes now popular. While other companies are replacing bottle-shaped canned coffee with 500-ml plastic bottled coffee, ITO EN will not change products (It can be considered that the bottle-shaped canned coffee is now unrivaled). While the green tea beverage market is expanding, the market share of ITO EN is estimated to rise 1 point to 34% in 2018. We hope that the company will secure sales and profit as assumed in the second half, and enter the next term with favorable performance. ◎Corporate Governance ReportUpdated Dec 3, 2018 Basic Policy "Always Putting the Customer First" is the ITO EN Group's management philosophy. In the ITO EN Group's Basic Policies, the basis of our business administration to take corporate social responsibility in cooperation with interested parties such as the government, local communities, consumers, shareholders, clients, suppliers, and financial institutions, in order to achieve sustainable growth and development as well as increasing our corporate value. This management philosophy is the fundamental policy behind our group's corporate ethics and the unchanging truth that supports our corporate governance. Based on this philosophy, all the executives and employees of our group will actively pursue an operation that works towards a sustainable society while responding to the trust of all the interested parties. To realize an appropriate form of corporate governance, our company, which has a board of auditors, carries out audits in which the auditors inquire the business conditions, the decision-making processes, etc. of the representative directors, the directors in charge or the employees of our group companies. The auditors attend the meeting of the board of directors every time to give their objective and impartial opinions regarding the audit situations concerning the company or individual issues, and audit the business executions of the directors according to the audit policies set out by the board of auditors. <Reasons for Non-compliance with the Principles of the Corporate Governance Code (Excerpts)> 【Supplementary Principle 4-11 (1) Policies for the balance, diversity, and scale of the Board of Directors】 The number of members of the Board of Directors of our company is up to the limit specified by our articles of incorporation. As for its composition, the Board of Directors is basically composed of the necessary and appropriate number of members for making effective decisions and securing substantial discussions. Although there are no female directors as of the date of submission of this report, we will make efforts to appoint female directors from the viewpoint of securing diversity in gender and internationality, and expertness. <Disclosure Based on the Principles of the Corporate Governance Code (Excerpts)> 【Disclosure in accordance with the principles of the Corporate Governance Code】 Our company has formulated "ITO EN Corporate Governance Guidelines (hereinafter called `our guidelines')" based on the resolution of the Board of Directors for describing our basic mindset and policy regarding corporate governance, and disclosed them in our website. Please check them at http://www.itoen.co.jp/eng/csr/activities/index.html. 【Principle 1-4】 Basic policy for the strategic holding of shares and the exercise of voting rights for strategically held shares In principle, our company does not hold shares. However, we hold shares strategically, if it enables us to conduct smooth transactions, procurement, or fund raising. If shareholding does not contribute to the enhancement of mid/long-term corporate value of our corporate group, we will decrease the number of shares we hold step by step. Regarding the listed shares we hold in accordance with the above-mentioned proviso (hereinafter called "strategically held shares"), we discuss whether the return from invested capital exceeds capital cost for each stock at the annual meeting of the Board of Directors. In addition, it has been confirmed at a meeting of the Board of Directors that ITO EN checks the meaning of shareholding from the viewpoint of maintaining and cementing mid/long-term relations with business partners, and will sell or decrease shares whose economic rationality or meaning of shareholding has diminished after having discussions with business partners. As for the exercise of voting rights related to strategically held shares, we examine each bill and comprehensively judge whether or not it would contribute to the enhancement of corporate value of our company and business partners. (Article 14 "Policy for strategic shareholding" of our guidelines) 【Principle 5-1】 Policy concerning Constructive Dialogues with Shareholders After grasping the cost of equity, our management has constructive a dialogue with shareholders, listens to their opinions, pays appropriate attention to their interest and worries, and explains our policies for revising our business portfolio, investing in equipment, R&D, human resources, etc. in an understandable manner, to make them understood. (Article 16 "Policy for constructive dialogue with shareholders" of our guidelines) For details, please refer to "Situation of IR-related activities" in this report.